Here are Philippine shopping deals this August 2013 which you can’t miss from Zalora, Asia’s largest online shopping network. This promo showcases women’s items (564 listed) including shoes, clothes, and accessories. Items are marked down from original prices at Php 500 only throughout August 7-11, 2013. 207 sports items including shoes, clothes, and equipment for men are available at discounted prices (up to 50%). Participating brands include Chloe Edit, Max and Cleo, Asics, Plains and Prints Exclusive, Collective.com, and Puma. You may also avail of other sales, deals, and promos. For first timers, simply sign up for the site and receive a coupon code to save Php 250 on your first purchase. Invite friends and get Php 500 more. If you’re a BPI Express Credit user, you can win up to Php 100,000. It’s included with your monthly statement mail. I got a voucher with 25% discount on any item at Zalora. 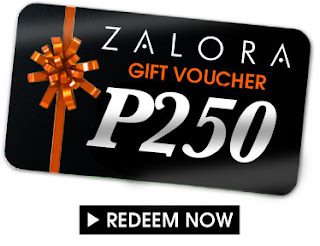 Enjoy your shopping deals at Zalora!